An improvement on last week! After last week's deficiencies of fish I needed to restore my sanity. The ideal opportunity arose last Saturday. My friend Paul Froom had arranged a trip to the River Kennet for us, the idea being to spin for chub and perch. With the everpresent possibility of pike we had to use wire traces. On the whole the river is shallow, clear and overgrown with trees. Now usually I am pretty good at fishing snaggy swims but wherever I cast there seemed to be an unseen twig or bit of cow parsley to grab at my lure. To cut a long story short we had a pleasant session and landed all the target species - although perhaps a bit smaller than we would have liked (Paul had landed a five pound chub just before my visit). With my confidence restored I Had a couple of short sessions on my local River Stour and although I caught nothing of any great size, I did land, chub, perch, pike and trout. All of the fish took plugs. By now I felt that it was time to return for a fix of sea fishing. 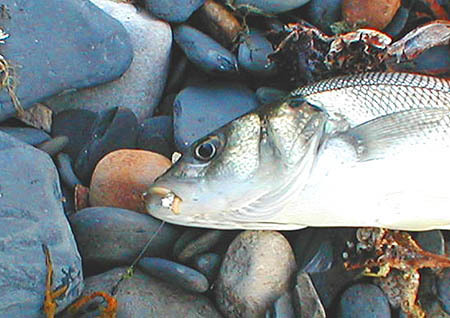 A morning session fishing the tide race produced nothing - not even a bite but my diary indicated that it was spring tides and a good time for an evening sortie after the maggot feeding bass and mullet. Nigel rang to ask If I fancied going so, even though the tide was a bit on the early side I decided to give it a try. We were disappointed when, despite plenty of maggots on the water, no surface feeding fish appeared. However, persistent Chug Bugging did produce a couple of modest bass. Two days later the timing of the tide was better. After a late return from the weekly shopping trip I grabbed the spinning rod and the bag and made for the coast. I was just in time for high tide and found three anglers had beaten me to it. Nigel and another friend Stewart Welton, were already plugging away. Another pal Nigel Hayward was fly fishing - they had caught nothing. Soon after my arrival the fish arrived in numbers. There seemed to be school bass everywhere slashing and boiling at the floating maggots. It was soon apparent that the fish were totally preoccupied with maggot feeding. You could cast a plug into the middle of a melee of feeding bass, time and time again, with no response whatsoever - this total preoccupation is very unusual. Meanwhile Nigel, with the fly rod, was hooking fish fairly regularly on a small booby with a shiny tail and white eyes - obviously close enough to a maggot imitation to fool at least some of the fish. 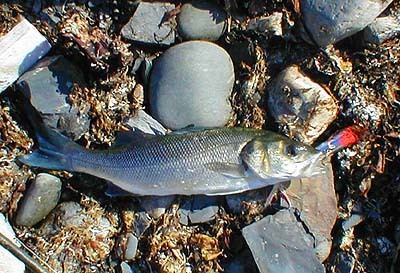 He landed half-a-dozen small bass and as it began to go dark, a small pollack. 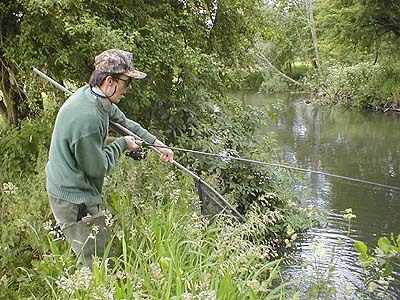 Stewart, plugging away, managed one decent bass and a couple of tinies. I had (you've guessed it) nothing! 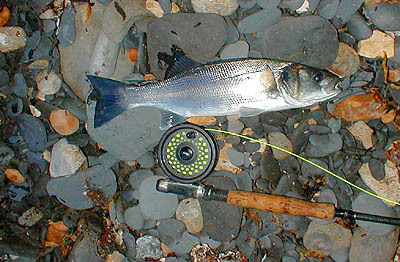 The following evening I went down on my own, this time armed with the fly rod. I waited until eight o clock before setting off, assuming that the fish would be even later than the night before. 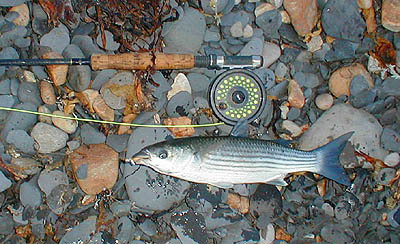 As it happened they did not turn up until nine so for half an hour I plugged away with my J11 for a single school bass. As soon as the fish arrived in force I picked up the fly rod armed with a polyethylene maggot. I tried a few casts with the fly unbaited - not a sniff! 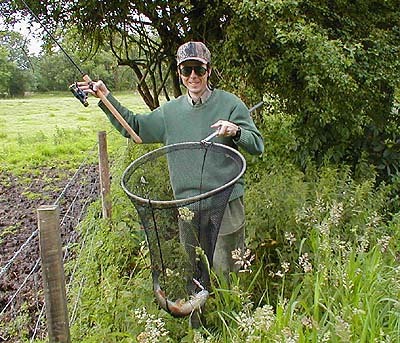 I progged four or five maggots on the hook and flicked the fly towards the fish - wallop! 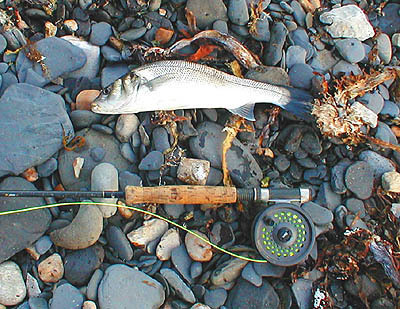 I was straight into a small bass which made several runs before I could draw it through the weed laden surf and onto the shore. 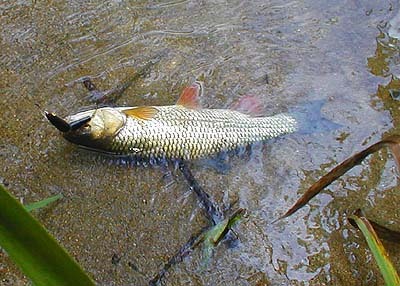 I took a picture, unhooked and released the fish and baited up again - straight into another, slightly bigger, fish. I repeated the process again and again, landing nine bass and a single thicklipped mullet before the fish moved away. One interesting thing is the fact that I easily landed, without a net, every fish that I hooked on the size 12 fly hook. I walked back top the car park and set off home - the car clock said ten-past-ten. An excellent hour's fishing. My first chub on the Kennet trip. 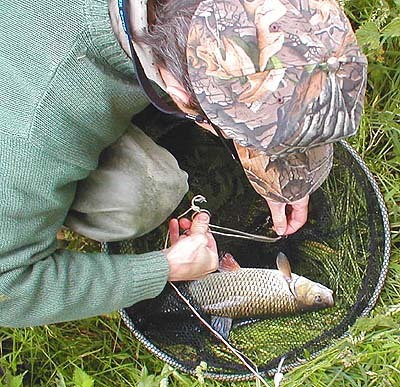 Paul landing his first chub. One of my chug Bugged bass. A bass on the maggot fly. The fly still in its jaw.